All transactions are safe and secure with a reliable history in online purchasing behind each of our associates. Buy the Maverick Top Gun t-shirt to own Top Gun clothing and merchandise. 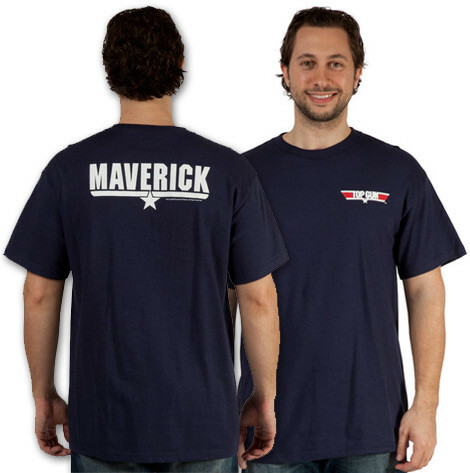 Sit in the pilot's seat with this Top Gun Maverick t-shirt that features the wings style movie logo on the front chest and the word "Maverick" on the back. Maverick is Tom Cruise's character's call sign. Whether you're entering a combat zone or just hanging out with your friends, this piece of Maverick themed merchandise will always keep you in style. Similar tees are available featuring Iceman, Goose, and Wingman logos. Wear this T with sunglasses to complete your Maverick Top Gun costume. In addition to the Maverick Top Gun tee above, browse the Top Gun Clothing Gallery for more apparel like men's and women's clothes, kids shirts or hoodies.